THE EPO scandals are certainly outrageous, but another outrageous thing which we have spent more than a decade covering is Microsoft’s patent blackmail against GNU/Linux. Recently, we took note of another wave of Microsoft patent attacks (albeit shrewdly marketed as “IP Advantage“) on GNU/Linux and Free software. For those who missed it, there is a listing of our articles about it [1, 2, 3, 4, 5, 6, 7, 8, 9, 10, 11], which will soon be shelved in some Wiki page. “Recently, we took note of another wave of Microsoft patent attacks (albeit shrewdly marketed as “IP Advantage“) on GNU/Linux and Free software.”In short, Microsoft is trying to divide the market into “safe” and “unsafe”, or “protected” (from Microsoft and its trolls) and “unprotected”. The former requires annual or monthly payments to Microsoft (subscription plus patent royalties, similar to Novell with SLES/SLED in 2006 onwards). In the mobile space, as one might expect, Microsoft is using a similar strategy. Microsoft will be Microsoft. It will continue to embrace and extend, then attempt to become an Android OEM while siccing patent trolls on all others. 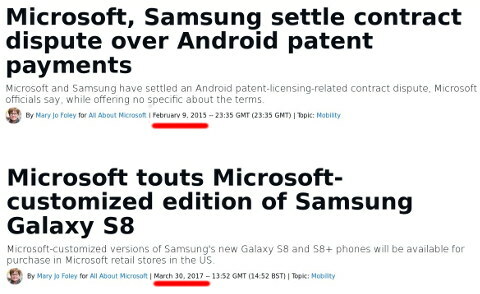 3 years ago Microsoft sued Samsung, the biggest Android OEM at the time, using patents and then they settled, with the condition/provision of Samsung being Microsoft’s slave, preinstalling Microsoft malware (sends user data to Microsoft) on Samsung’s Android devices. We never forgot about that, but Mary Jo Foley seems to have conveniently left that out of her new article. She ought to know this because she covered the subject of the lawsuit pretty well 2 years ago (she was one of our primary sources at the time, hence we reproduce her article at the top). What is shown now is that “Microsoft touts Microsoft-customized edition of Samsung Galaxy S8″. So Samsung’s ‘flagship’ product is becoming just a vessel or a carrier of Microsoft malware. Does Microsoft pay Samsung for this? No. That’s just part of the patent settlement we presume. And Microsoft is now selling these phones, i.e. making a profit as an Android OEM, where Android is not really Android but some ‘bastardised’ version of it which is dominated by Microsoft and designed to give Microsoft total control of everything (collecting input from the file system, cameras, microphone and so on). “And Microsoft is now selling these phones, i.e. making a profit as an Android OEM, where Android is not really Android but some ‘bastardised’ version of it which is dominated by Microsoft and designed to give Microsoft total control of everything (collecting input from the file system, cameras, microphone and so on).”Is this justice? Is Samsung happy about this? At first sight, that denial appears to be complete and clear, but at a closer look it doesn’t convince me. Apart from the fact that Qualcomm obviously could never admit to totally anticompetitive behavior (restriction of competition), in this case going back to an agreement signed in 1993 and failed negotiations a few years ago, the denial merely says that Samsung could somehow have sold chips to third parties, but not that Samsung could have sold, for example, CDMA-capable chips to third parties. As AndroidAuthority notes, Qualcomm sued a Chinese Samsung customer (Meizu), which built some devices incorporating Samsung’s Exynos chipset, and I agree with AndroidAuthority that “we have to wonder why the Korean giant only sells its mobile SoCs to one small company in China” (in light of Samsung’s large customer base for other types of chipsets). This is why phones have become so incredibly expensive (manufacturing of the underlying components is not expensive). It boils down to patent tax everywhere. That money one pays for an Android device ends up not entirely in the coffers of the OEM but all sorts of patent parasites, including Microsoft.